Noticed our 125 gal salt water tank has some tiny star fish. I would like to put my sea urchin in my 125 gal tank, will they kill him? Recently I have had had a plague of these stars in my reef tank. Normally they are harmless so I'm told but they are crawling on my soft corals and leaving snail like trails on them causing them to not open properly. These Asterinas are also eating my coralline algae.....doh!!!! I have put a harlequin shrimp in and was wondering on how to thin these blighters out or destroy them completely. Is the harlequin the best option here? I can dip some of them and one in particular a lovely Sinularia hasn't opened fully for some months now due to this plague . I've added a harlequin shrimp. Am I looking at losing the softies to these little munchers? Hello, I am starting to notice a lot more Asterina starfish in my tank as of recent. My tank set up includes a mixed reef type tank with some "reef safe" predatory fish e.g.. Niger trigger, Volitans at present. I am looking for a species of wrasse or other type of fish for that matter that will decimate my Asterina population. ANY SUGGESTIONS? What about a Twin-spot Maori wrasse, Tuskfish, or similar species that eats starfish? Any help would be appreciated as I am tired of looking at all the white blotches of coralline that these guys are eating. Thanks for the help in advance guys/girls. Oh yeah, My tank is 85 gallons so nothing too large! I really want a new fish addition anyways. My nutrient level is around: 5-10ppm of nitrate, and phosphates are @ 0ppm. I am not noticing any film algae or hair algae that should be promoting the growth of these guys, just my coralline! :(thanks in advance for any suggestions or help with this matter. About 3 months ago I had a SPS about 3" tall eaten by something. It started at the base, the 1st day about Â¾ inch of the coral was eaten completely around the base. I looked at it in the tank and wondered what was going on with it but I had to leave and could not look at it more closely. The next day the coral was completely eaten and I could find nothing on or around it to blame for the destruction. Fast forward 3 months to today I found another of my SPS corals in the same predicament. This specimen was completely healthy on Sunday; Tuesday morning, I found it in the condition you see in the picture. About 2" of the base of the coral was completely eaten away and I immediately removed the coral from the tank to examine it. On the white, eaten away area of the bottom of the coral, I found this small starfish (.200" across). I don't know if this guy is the culprit or happened to be in the wrong place at the wrong time. It seems odd that such a small starfish could eat so much so quickly but he right now is my prime suspect. Being a juvenile I am having trouble identifying exactly what type of starfish it is and was hoping the photos would help you answer my question. Could this guy be what is killing my coral? <Lloyd, the starfish you have is definitely an Asterina species. There is much debate about whether these starfish actually eat coral or not. Some reports indicate these starfish may just be feeding on an already degrading coral, other reports indicate that they are known to feed on Montipora corals and Zoanthids. Necrosis and bacterial infections can also cause what you are seeing. Bottom line, as far as I am aware of, no documented proof exists that they are known coral eaters. They are opportunistic feeders and likely can likely adapt to eating most any food in a captive system. The Asterina family is huge, and there very well may be species of Asterinas that may eat corals if other food sources are depleted. I have Asterinas in my tank, and so far have not bothered any of my corals. 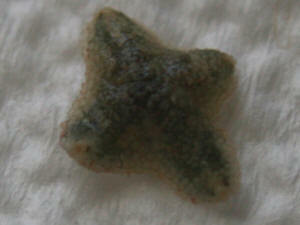 Best bet, if you suspect this, remove the starfish and further observe the health of your corals. I have removed the affected coral to my frag tank to observe for a while. So far (1 day) no further dying has occurred. The starfish has been removed and is living temporarily in a Petri dish awaiting proper disposal. I am surprised that a bacterial infection could destroy this coral so fast without affecting any other coral nearby. I will let you know if it survives the week. > I did find your reply re: coral eating starfish interesting. I've read Calfo's piece on this, and his hypothesis that these starfish may eat the corals when there's not enough other stuff for them to eat. > I wonder though, if by analogy with snails and plants in freshwater aquaria, Calfo hasn't got this back to front. In freshwater tanks snails are often maligned for eating plants, but very largely they only do so when the plant is dying anyway, and they eat soft or decomposing plant matter. Could it be that Asterina only eat sickly/dying corals? So rather than providing more food for the Asterina, what you need to do is keep nutrients so low that the corals are healthy. My guess being that healthy corals have nothing to fear from Asterina, just as healthy plants are largely immune to predation by small snails. I have a beautiful 75 gallon saltwater tank that has been taken over by Asterina starfish. We are talking about hundreds if not thousands of them. At first they didn't seam to bother much, but, now there are so many of them and they are eating my coralline algae so fast. All of my live rock that was beautifully covered in all shades of purple are all pinkish. I took a half a day and picked out as many as I could (a small butter container full) and the next morning it looked as if I had done nothing at all. So here is my question, I would like to get a harlequin shrimp, but, I have a very large brittle starfish that I have had for 2 1/2 years (we love to hand feed him). Will the harlequin shrimp attempt to eat him as well? If so what would be the next step? arrow crab and cleaner shrimp. The rock is full of brittle stars and bristle worms. The Astrea star fish are eating my coral xenia colt and finger leather. My question is could i add a C. valentini puffer to feed on the starfish? and would it effect my other inverts/corals? Last week I removed and returned to the LFS a healthy Picasso Trigger that was getting a little too bossy for the tank. Final straw was when he killed a Chromis of mine in a rather brutal display of aggression. Anyway, removed him and went on a 1 week business trip. Upon my return I noticed 9 Asterina starfish on the front glass - never saw any before and I keep a daily log of observations, problems etc. I can only assume the trigger kept the population in check. Not advocating anyone get a trigger to control these things but my Picasso sure did! <Heeee! Am considering getting, keeping a grizzly bear now to keep the neighbour's dogs off the lawn! I'm thinking the Grizzly Bear may be a bit overkill, but I did find a good deal for you on a Black Bear which should do the job once he grows up. See below. "Black Bear for sale, AWESOME CUTIE ! They don't get any better than this one. He'll make your heart all warm and fuzzy. Re: Asterina Seastar Populations, & Gnathophylliid f' - 03/21/08 Thanks Eric. <<Welcome Vinh>> Do Harlequin shrimp is reef safe, and peaceful with other inverters? Thanks, Vinh <<Depends on your definition of 'reef safe' I suppose 'but other than Echinoderms, your other inverts should be spared from the shrimp's diet.